This old fashioned recipe undoubtedly dates back to the days of iceboxes which preceded modern refrigerators. It is another handwritten old recipe from a file of my grandmother's which I am going through and testing some of the recipes. My mother was young enough to remember iceboxes out at her parents lake cottage. They did have a refrigerator in the City of Milwaukee. But things were still a bit more primitive at their lake cottage which was used during the summertime. This Refrigerator Cheese Torte is attributed to Alvina who was a great aunt of mine. One of her two sisters was my maternal grandfather's mother. She was my great grandmother whom we called "Granny." I remember my Granny and also my Aunt Alvina when I was a child still living in Wisconsin. Readers can see a photo of the three sisters below. 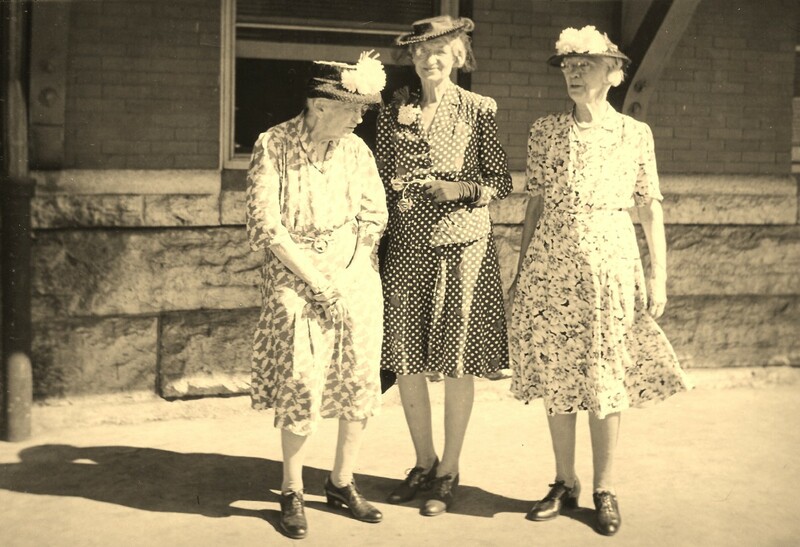 My great aunt Alvina is the tallest of the sisters in the middle. It is her dessert recipe that will be featured in this article. This no bake recipe is a light and airy gelatin concoction made that way with the additions of whipped egg whites and also real whipped cream folded into this lemony flavored dessert. 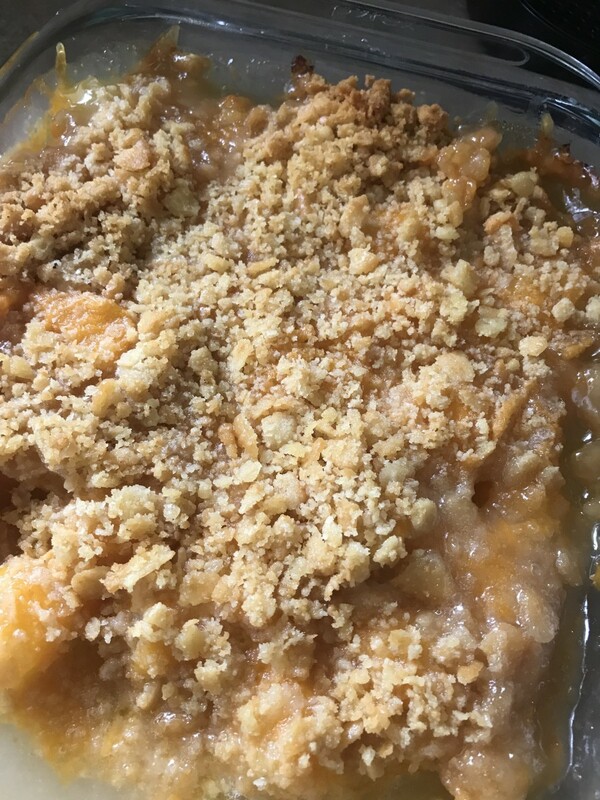 It was a crowd pleaser when served to some of our dinner guests recently, so I am happy to be able to share this sweet heritage recipe of yesteryear with you modern cooks of today. 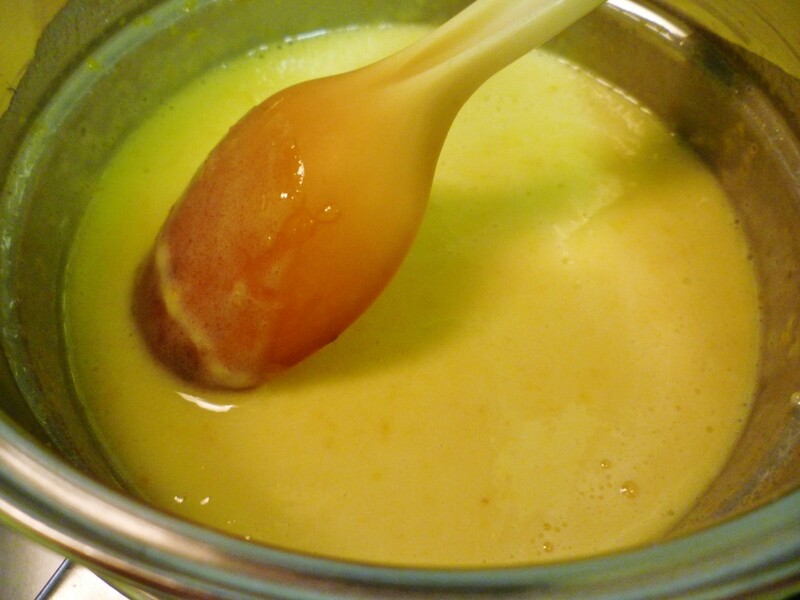 Put slightly beaten egg yolks in double boiler with salt, milk and sugar. Over the heated water, cook until it thickens, stirring occasionally. 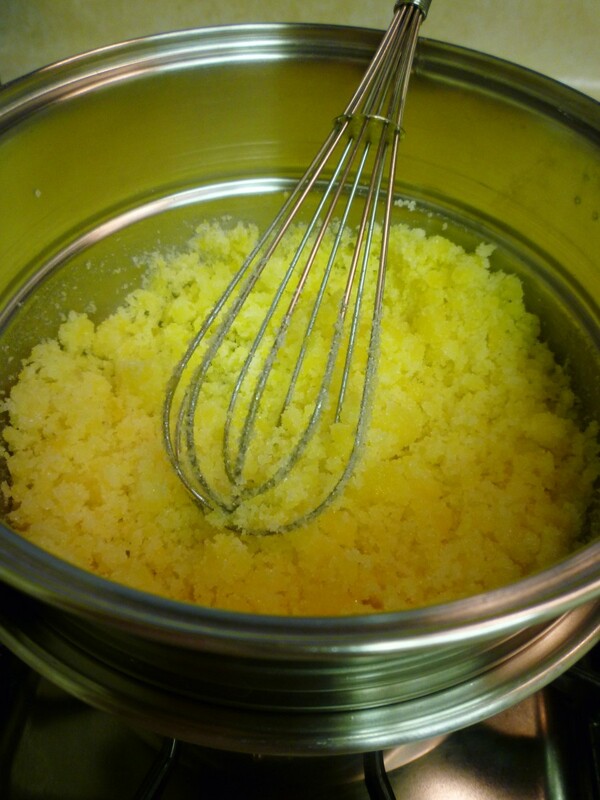 Remove from fire (heat source), add grated lemon rind and gelatin...stirring until gelatin is dissolved. Then cool. 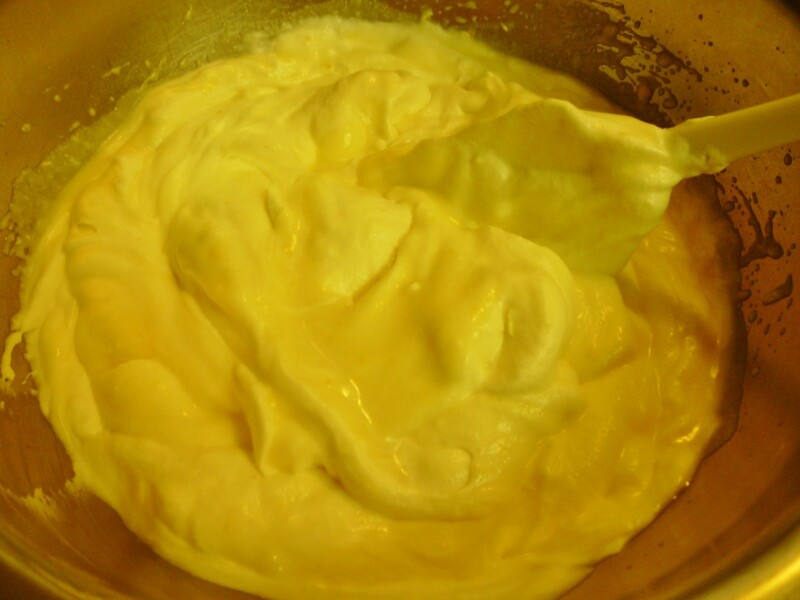 While mixture is cooling, beat the egg whites until they form stiff peaks. 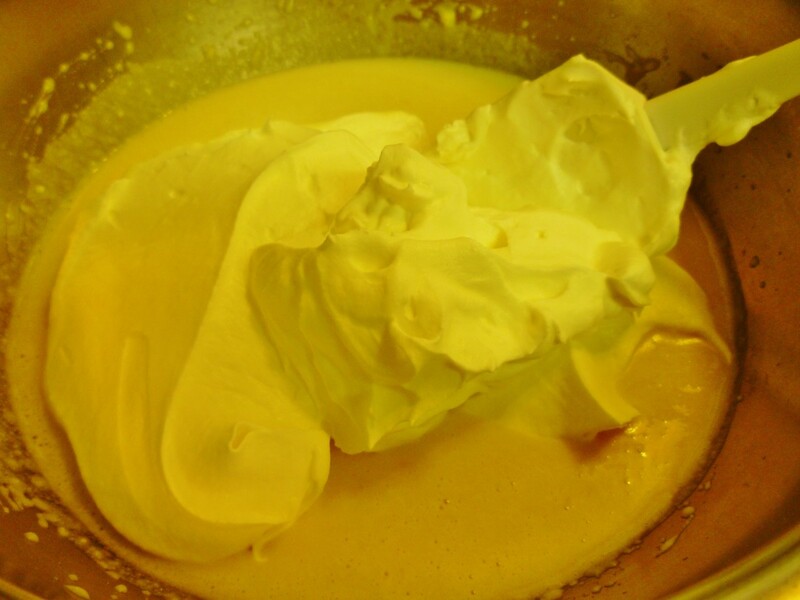 In another bowl beat the whipping cream until it is also well whipped. 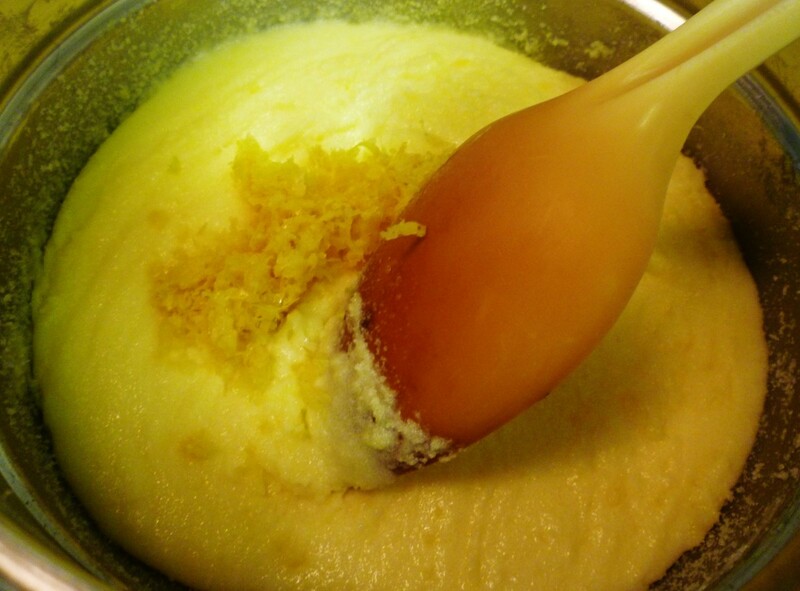 Before gelatin hardens, beat in cottage cheese, lemon juice and the vanilla using an egg beater. Next, fold in the beaten egg whites and whipped cream. 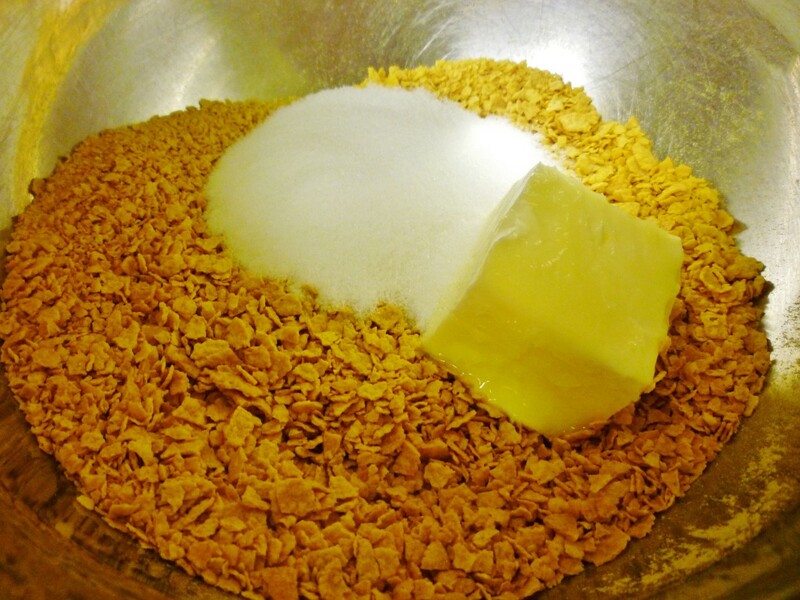 Pour in the cheese mixture and cover with the remaining cornflake crumbs. Chill thoroughly for five or more hours. Back when this recipe was handwritten there were no instructions on how to make the cornflake crust. It was probably well known to the home cooks back in that era but I had to search to find a recipe. I found an online newspaper recipe dated September 8, 1950 from the Deseret News that posted the recipe. So I will share my findings with you. The cornflakes, butter and sugar are already listed as the last three ingredients already posted up above. 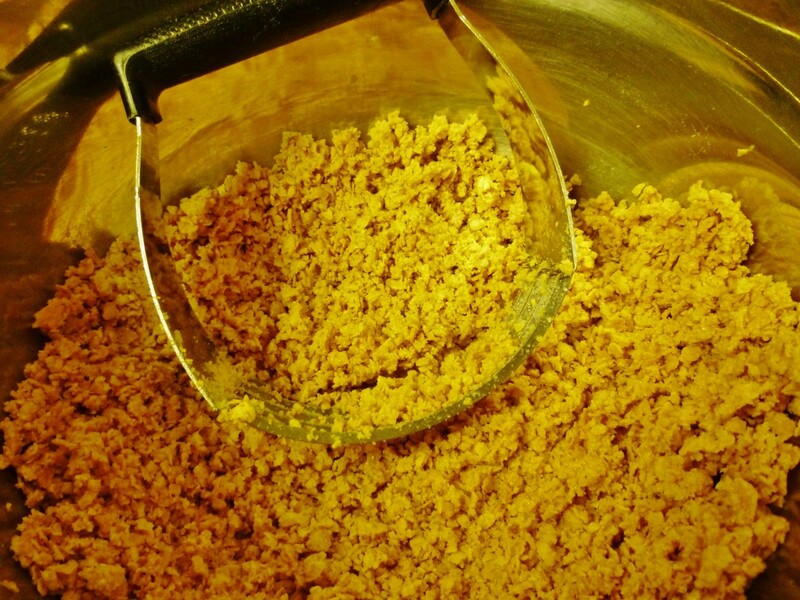 Roll or grind cornflakes to make 1 cup of fine crumbs and combine with the sugar and the softened butter. Reserve some of the crumbs for the top of the cheese torte. Chill the crust before the cooled filling is added. This step needs to be done before the cheese mixture is made. 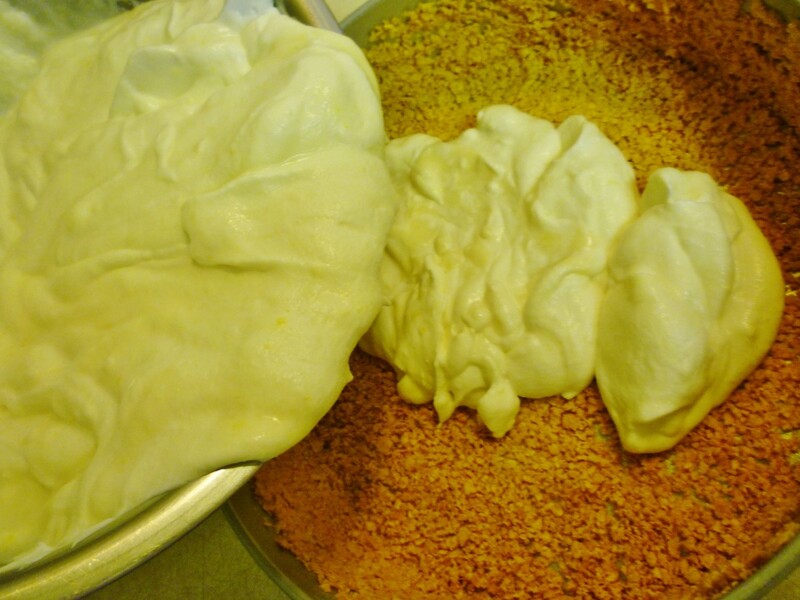 Note: I allowed an hour or so in the refrigerator for the crust to set up before starting the cheese mixture. I crushed the cornflakes but think that next time I will use a rolling pin and make the cornflakes more of a fine dust consistency. Did you know that the readily available corn flake cereals of which most anyone reading this is undoubtedly very familiar started out as a result of an accident? Sometimes inventions are purposeful and intended and other times they are unexpected as happened in the case of corn flakes. In the State of Michigan back in the late 1800s was a sanitarium operated by Dr. John Harvey Kellogg. His younger brother, Will Keith Kellogg operated as the business manager at the Battle Creek Sanitarium. The brothers were both Seventh Day Adventists and believed in treating their patients with a vegetarian diet devoid of not only meat but also things like sugary items, alcohol, tobacco and even stimulants like coffee or tea. Exercise and fresh air activities were promoted. Wealthy people from all walks of life came to be managed as well as pampered much like going to a health spa today for a week or more of good diet, exercise and treatments. One day some cooked wheat that had been left awhile turned stale. But hoping not to waste it they rolled it out thin and upon toasting it, flakes were discovered. The sanitarium patients probably liked the change of pace regarding diet and wanted more. It was decided to try other types of grains and create similar taste treats for the patients. Lo and behold a business was born! A patent was issued in 1896 and Will Keith Kellogg founded the Battle Creek Toasted Corn Flake Company in 1906 which later became the Kellogg Company in 1922. 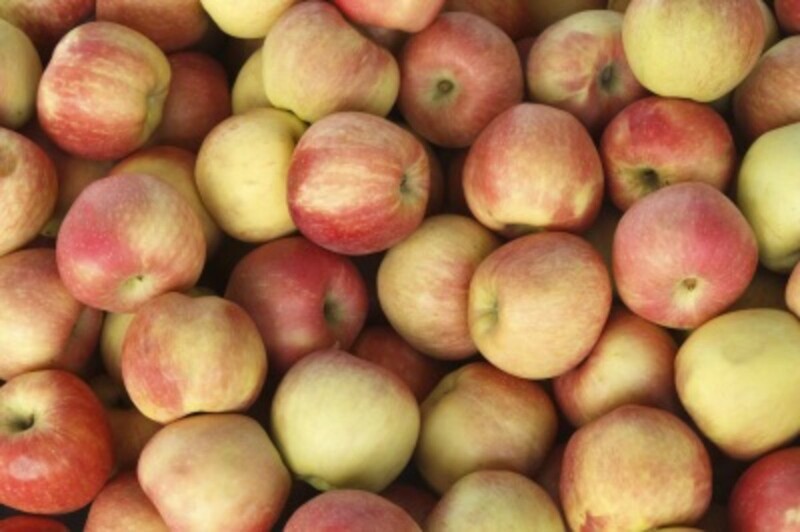 Today this huge business conglomerate owns and manufactures all kinds of food items worldwide. This is a much lighter recipe compared to most cheesecake recipes. 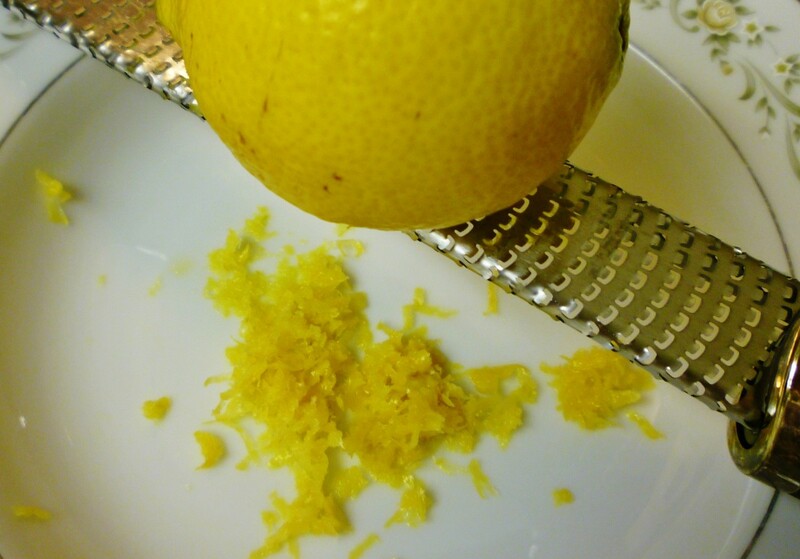 It is not an overly sweet dessert but rather more on the refreshing side with the slight lemony tang. I think that lime zest and lime juice would make for a nice variation if something other than lemon was desired as a flavoring component. 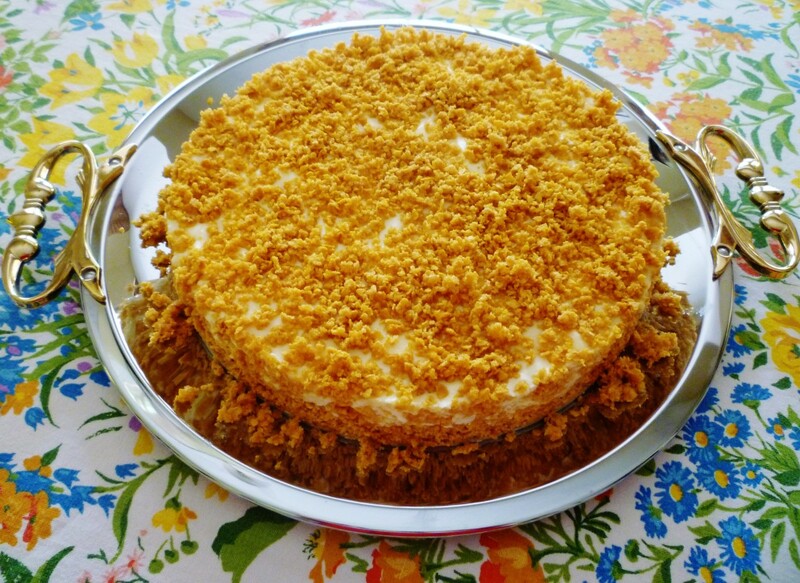 A graham cracker or other crumbly crust (even no crust) could be substituted for the cornflake crust called for in this heritage recipe in my opinion. It was fun however keeping this dessert recipe true to the past. I hope that you enjoy this recipe from the days of yesteryear. 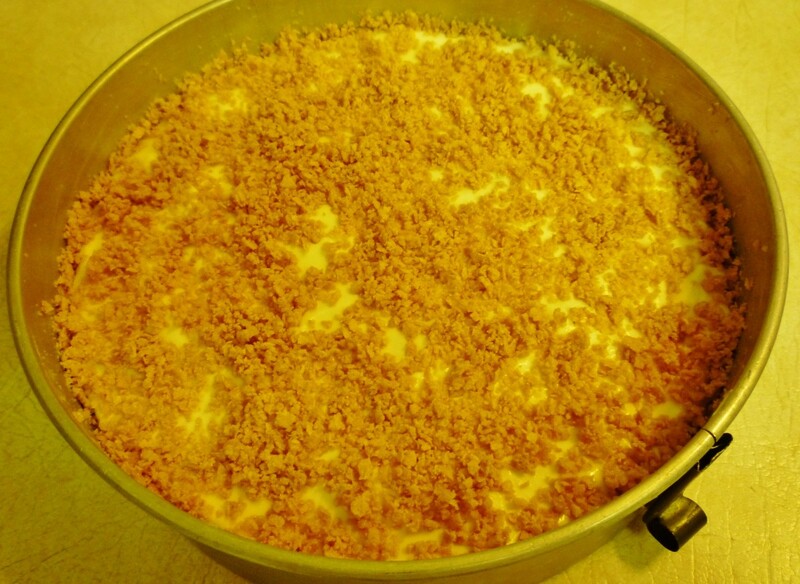 Please take time to give this no bake, light and refreshing Refrigerator Cheese Torte Dessert Recipe a star rating. Thank you!!! Do you think that you will be making this old fashioned Refrigerator Cheese Torte? Probably not, but it was interesting to see and read. This is a good cheesecake recipe and certainly easy enough to make. Glad you like it. As to the cooler temperatures, we are enjoying them as I know you must be also. More great photos! But this is truly a delicious recipe. I know some people don't like cheesecake, but I think many of them would like this one if they were to try it. It is superb! Cooler temperatures at last! Hope you are well, Peggy. 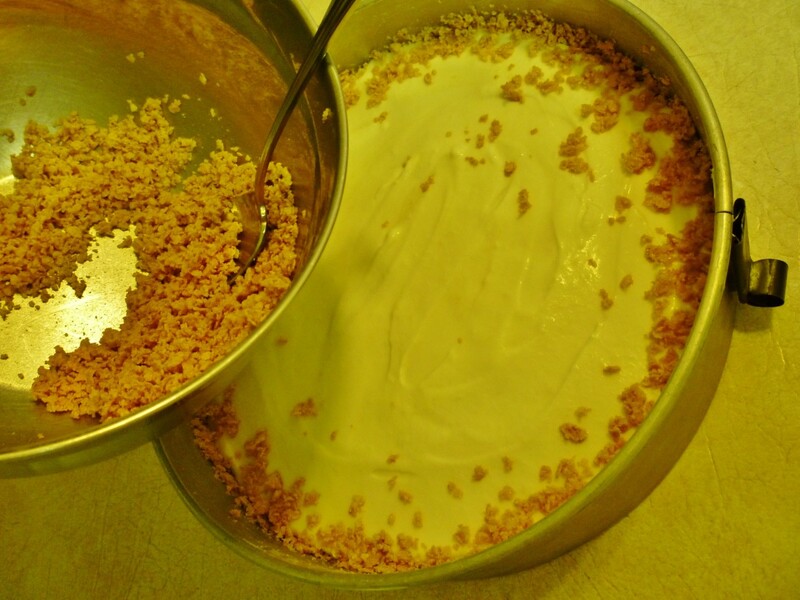 My all time favorite cheesecake was made by a great aunt who used Ricotta cheese in it. That was a long time ago and will always remain the best in my memory. 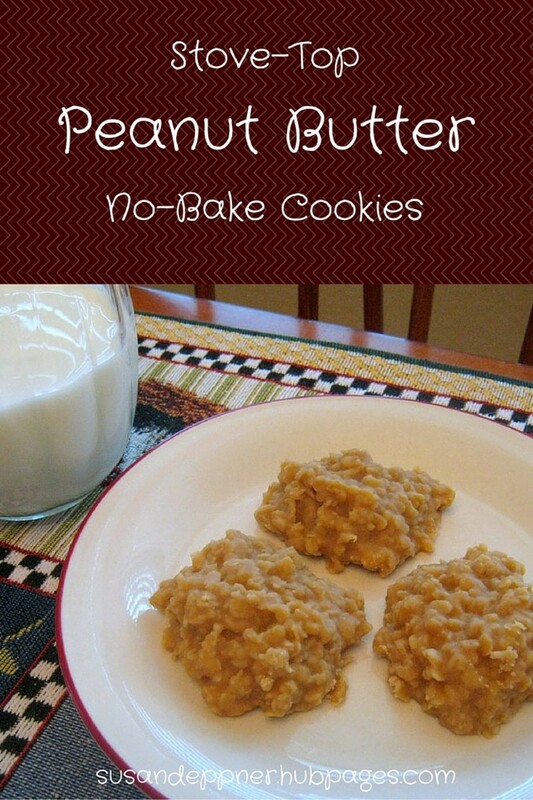 This recipe is totally different from hers, but it is good. Hers was a baked recipe. Wish I had the recipe! Hope you enjoy the recipe. I also have a variety of cookbooks and some of them are vintage. It is fun to try a wide variety of recipes. Thanks for your comment and the ratings, etc. That is certainly an old recipe! 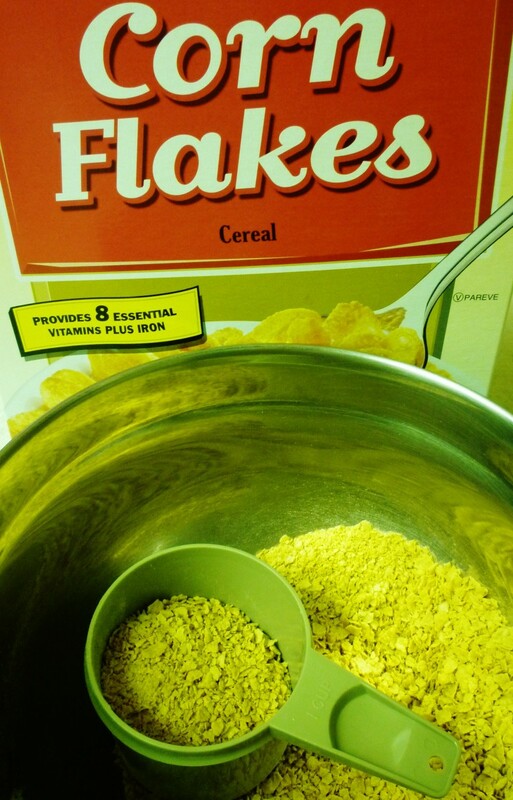 It took some intensive digging to find out how to make a corn flake crust. Someone who created this a long time ago probably only had that in the house and used it as a substitute. Often recipes come about in exactly that manner. Thanks for the share. I am not familiar with using cottage cheese in a dessert. It looks yummy and I would like to try it. So often the old recipes like this one are really great. When I have more time I should try out some of the other vintage ones in my grandmother's collection. Hope all is well with you and your family. Yes, we are now reaching the 90's here in Houston also and with the humidity it will feel like the upper 90's. Air conditioners will be humming now until much later in the year for sure! The no baking part of this dessert is nice. After trying the corn flake crust, I think that a graham cracker crust would be equally as good or perhaps even better. Thanks for the share. Stay cool up where you live! Your leading photo reminds me of some of my favorite cook books, so I will definitely try this delicious recipe! Rated Up and more. I love it when you share those family photos! Great looking Cheese Torte. I've never tried corn flakes in a pie crust, but why not?? Will share here and Pin to my dessert board. Okay! This sounds divine. Old fashioned is often the best!!! Angels are on the way this evening. This recipe always looks so delicious and tempting, especially on days like we've had here in North Texas -- 93 degrees F. Going to be in the 90s most days from now until mid September. 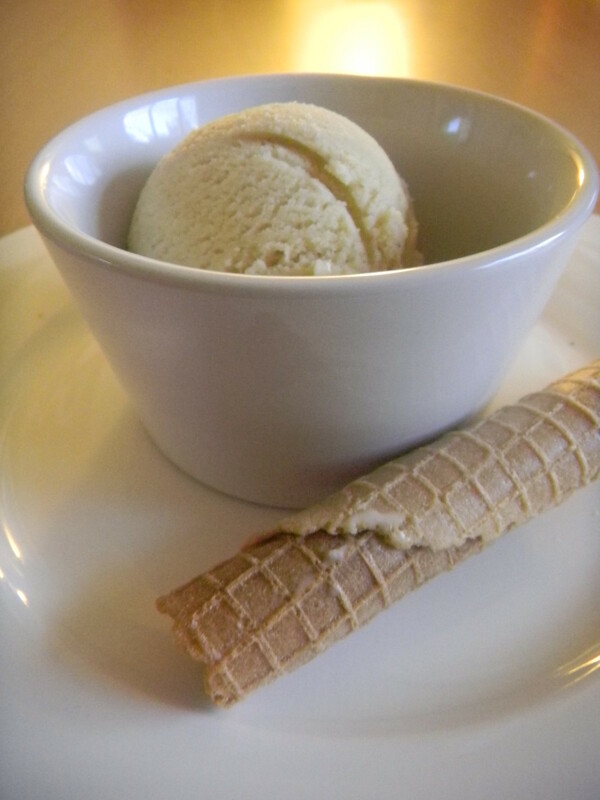 :( But a lovely cool desert like this can make it better! Sharing this again for people who are looking for something for a special occasion or just to sit back and relax and cool off. I love cheesecake and this looks so pretty. I think it would be perfect for welcoming spring and for a special dessert for Easter. That it is an heirloom recipe makes it even better. I love, too, that it's no bake! Already pinned to my 'Fabulous Desserts" board, so I'm going to pin it to Awesome HubPages and post it on FB. Will of course share with my followers. Happy Easter! Yes...cornflakes are actually called for as a crust in this recipe. it looks very easy, can i use corn flake crumbs on top instead? This looks so delicious! Way past my bedtime (4:30 will be here in no time), but I sure do wish I had some of this for a snack. I can taste it just looking at the wonderful pictures! Pinned to Awesome Hubpages. Glad to hear that you liked the sound of this old fashioned recipe. Whatever you did to it...I could now access it. Thanks! Moonlake was having trouble accessing my Pinterest acct the other day. It works fine when I click on it, but just the same I made a small change in the URL. I wonder if you would mind trying it again and let me know if it works? Know I was here just the other day, but I didn't have my Pinterest account then. Pinning this scrumptious, easy desert, to what else? My desert board, of course! 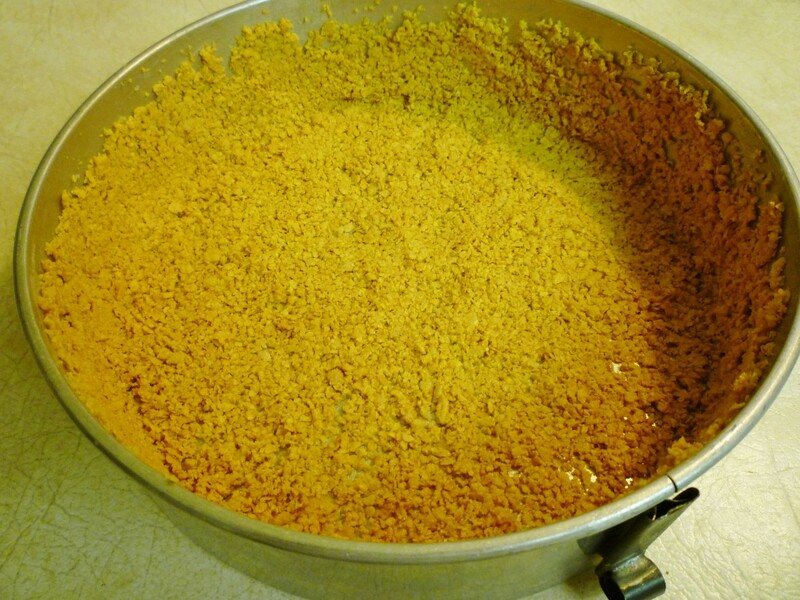 It took me a while to find a cornflake crust recipe because this recipe is truly old. I think that it would be good crust-less. Might try that next time. It is light and refreshing. Thanks for the share. This is a great summer desert and one of my favorites! Sharing this with my followers again to remind the longer ones that this is a great time for this desert, and to introduce the newer ones to this super yummy recipe! The egg yolks are actually cooked so it is only the egg whites that are not cooked. I remember a time when people used to commonly make eggnogs and use raw eggs and also Caesar salads. I have eaten many of them in my day and so far have never had any ill effects. :) Thanks for your comment and votes. Nice that you will be able to put your springform pan to good use with this simple recipe. Enjoy! And thanks for your comment. Oooh - YES! I want to try this! It looks so good, and it looks easy. And besides, I have a springform pan with not enough recipes to use it that often. Sounds so yummy, and easy. And your aunt sounds like she was a treasure. Yes...it was hard locating a corn flake crust recipe, but I finally found one from an old newspaper posting. Nice to know that you like the sound of this recipe. I think that I will try it using graham cracker crumbs the next time. Thanks for your comment, votes and shares. Very interesting recipe and the final look of the refrigerator cheese torte is very appealing. It is interesting to note you dug out an old recipe for the cornflake crust to go with this vintage recipe. Voted up, useful, interesting and sharing and pinning. I am having fun getting to learn about Pinterest and sharing photos on it. Thanks for the pin! I've check this recipe before but never pinned it now I will. I looks so good. I had not heard of cornflake crusts either but fortunately located an old recipe for one. They must have been common at one time many years ago. Thanks for your comment and votes. Actually the photo is of my great grandmother and her sisters, one of which is the author of this old fashioned refrigerator cheese torte recipe. The dresses and hats certainly date the photo! Thanks for the share and vote up. I have never heard about corn flake crusts.. Thanks for sharing a rare recipe. It is worth trying. voting it up, interesting and awesome. Great photos! I want to make some no-bake cakes, too. Thanks for the idea. Let me just say, I adored your grandma (and siblings) photo. They look adorable with their Sunday dresses! Sharing and voted up. This old fashioned recipe is indeed very light and airy to eat. If you decide to try it, let me know what you think. Thanks! A cinnamon graham cracker crust and an orange flavor in place of the corn flake crust and lemon lemon flavor would also be delicious. The refrigerator cheese torte is extremely light which is what I liked most about it. So nice that reading this brought back good memories for you of your grandma and your mom. Thanks for leaving a comment. My Grandma Myrtle made this for my mom every year for her birthday cake with the variation of a cinnamon graham cracker crust and ours does not call for lemon, but rather orange, which was optional and my grandma didn't use. Light, refreshing, honestly good. It is delicious and instantly takes me to my grandma. The actual refrigerator cheese torte is very light. You could even consider eliminating the crust if wishing to eliminate more calories. Personally...except for looks...I don't think it added that much. Might be fun to make it in individual ramekins crust-less and just serve it with some fresh berries. I might try it that way next time. Let me know how you like it if you decide to make it. Thanks! I know I have read this before but everytime I am looking for sometime new of yours to read my eyes keep coming over here and my mouth starts drooling and I just really want some. I might have to break the diet and break down and make this!!! This refrigerator cheese torte is extremely light and airy! Hope you enjoy it. Appreciate your comment. I rarely make things like this cheese torte unless we are having company over because it is just the 2 of us...and even then I send some home with our guests or give excess to neighbors. Nice of you to gift that young man with the entire cheesecake. I'll bet he was popular that night when he got home! :) Thanks for your comment. Emmmmmmmmm I haven't made it but it sure looks good. A customer once gave me a 15 inch cheescake that I gave to a high school kid standing at a bus stop. I am just one person and he said he had five brothers and sisters. Hope they all enjoyed it. Nice to know that you liked learning some of my family history behind this refrigerator cheese torte recipe that needs no baking. Appreciate your comment, votes and the share. Thanks! Glad you liked the sound of this cheese torte recipe. Wonder if any of the ingredients in South Korea are at all similar? Thanks for your comment and the share. What a fantastic story, a great bit of family history . Your recipe sounds delicious and I can't wait to try it! Thanks so much for sharing this VU, across and shared! When I saw that no cooking was involved, I was excited about trying this. However, unfortunately finding those ingredients in South Korea may be more than a slight challenge lol. Hopefully some of my followers will get to try it though. Since your mom has memories of an icebox, you might wish to read my hub concerning Ice Box Cookies. I actually have a photo of a truck that used to deliver ice for the ice boxes back then. Thanks for your comment, vote and share. What a fantastic recipe! Loved it! My mom used to tell us stories about the first apartment she and my dad had in upstate New York when they were first married. It had an icebox instead of a refrigerator. She even had a regular delivery of block ice (they were married 16 1961). First of all, congratulations on your marriage. Second, thanks to billybuc for recommending my hubs. Third...enjoy this old fashioned refrigerator cheese torte recipe with my blessings! Appreciate the comment. Some of these old time recipes handed down from our older relatives are truly worth making over and over again. Fun to think of them enjoying the same tastes years earlier. It is the continuation of a family tradition and connects us to them whether or not we ever, in fact, ever met them. Appreciate your comment. So happy to hear that you liked this old fashioned recipe of the cheese torte that does not even need baking. Appreciate your comment, votes and especially the share. Hi, Peggy, it looks absolutely delicious, I have to try this recipe, I think my kids will really love it and of course I loved you sharing with us this was such an old recipe... these little things are really something, reminding us as little children, growing up with these wonderful recipes from our great grandmothers, grandmothers or in this case your Great Aunt... Voted up and sharing! Have a great day! I am very fond of cheesecake. Nothing beats a fine heritage recipe as yours! Family recipes are very precious which are treasured by loved ones like you always. Your instructions and step-by-step photos are direct and handy. The first and last photos looked so luscious and well-photographed that they looked like they are in some top gourmet magazines/best-selling cookbooks! Well-done! Nice that you also have recipes from your grandmother. She sounds as though she was a great cook! Thanks for taking the time to leave a comment. This refrigerator cheese torte is indeed delicious and light. Thanks for your comment and the sharing of this hub. So glad that you liked the sound of this old fashioned recipe. Nice that you are able to change your Italian recipes into English so that future generations will be able to enjoy them. Thanks for all of the votes and share. 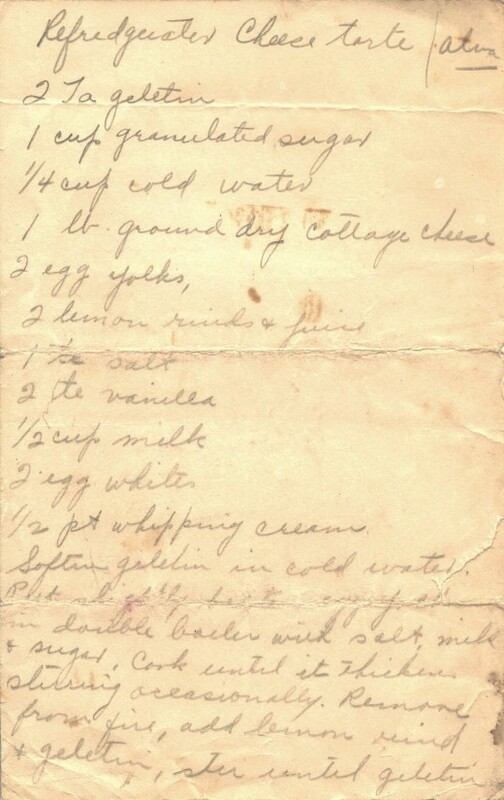 I too have some recipes from my Grandmother, it is wonderful to see her handwriting and remember her making the recipe. Often she never used a recipe so she had to sit down and think what she used in it, to write a recipe for me. 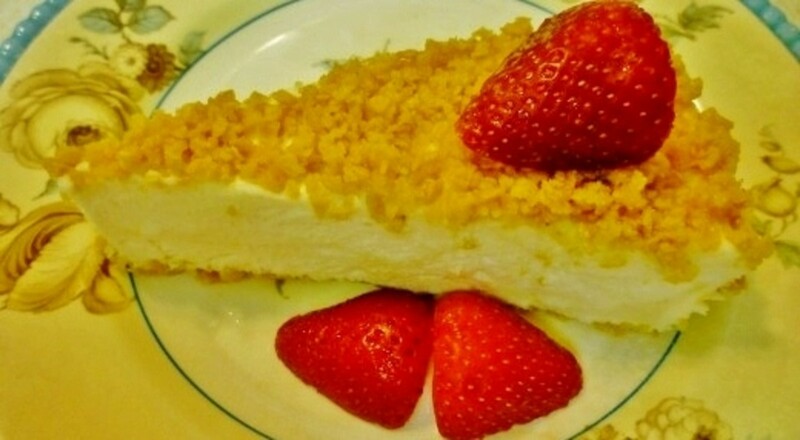 This cheese cake looks simple yet delicious, most great recipes are. Definitely a 5 star rating for this hub, Peggy! Ricotta cheese, lemon, whipped cream - this torte sounds extremely delicious! Crushed cornflakes sound like a lovely addition, too. I love the idea that the recipe was created by your great aunt. I will share this hub. Fantastic recipe hub ^_^ I love the photo of the old recipe, it looks just like a lot of my family recipes (a few of which are still written in Italian). I've also been going through mine and rewriting them for future generations. This sounds like it would have a wonderfully fresh flavor, great for summer. Good choice on changing the cottage cheese to ricotta as well. The only complaint... I can't pin any of your beautiful pictures :( Voted a bunch and shared! So glad to hear that you not only liked the sound of this recipe, but how the hub was composed using the family photo, handwritten recipe, etc. Thanks for your comment. The cheese torte will taste great if it tastes anywhere near as good as it looks in your photo. I just love the way you personalized this with the old hand-written recipe and the family photos! Old recipes like this are like "antique treasures." I have quite a few more that I should try making one of these days that are handwritten by my grandmother. Hope you enjoy this refrigerator cheese torte when you make it! Thanks for the votes. I think a graham cracker crust would also be good on this refrigerator cheese torte recipe in place of the cornflake crust. Glad that you liked the sound of it. It is light and delicious. Oh wow this looks so good. I just bought a new spring form pan as my old one had had the biscuit and this would be the perfect recipe to brake it in. That is so nice that you found a batch of your grandmother's old hand written recipes! I also have some that were written in an old journal and many of them were from family members. Most of it was in my grandmother's handwriting. I have been trying out some of them and have to guess at some of it...the baking times, etc. as it was not mentioned in several of them. Nice to be able to taste these old recipes this many years later. Good luck with deciphering yours! Sadly I will not be able to make this. Out of all the kitchen gadgets I have, I do not have a spring pan... :( But maybe this might be my reason to get one. I have seen several recipes I have wanted to try that call for this type of pan and I pass them up everytime because I don't have the equipment. I am not an expert with regard to answering your question. Perhaps some crusts are baked first? If most cheese torte recipes have similar ingredients, I would guess that they are simply refrigerated. I would also try this without a crust to eliminate some calories. Thanks for your comment and votes. Are all cheese torts no-bake or just this particular version? Sounds delicious and the no-baking part means less chance for me to mess it up. Voting this Up and Useful. It is nice to have recipes especially in the summer where the kitchen does not have to be heated up. 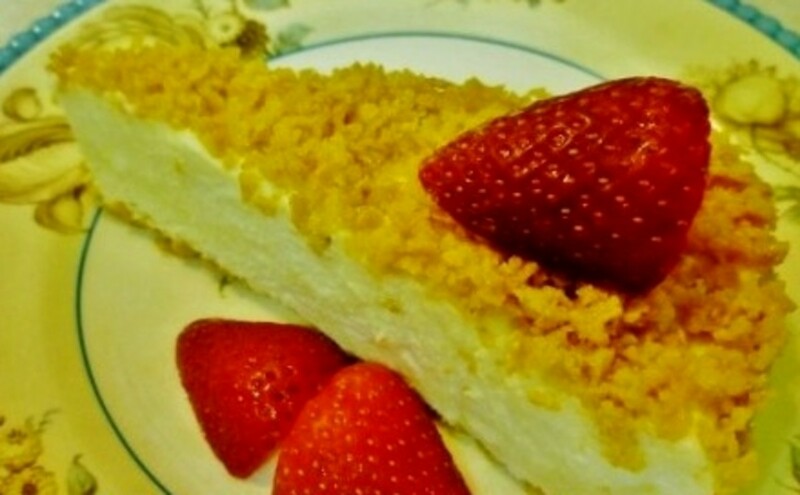 Am sure you would like this refrigerator cheese torte if you give it a try. Have you never eaten jello? Thanks for your comment. Hi Peggy - I love your old family recipes! And this one would be great for a summer dessert. No oven heating up the house. 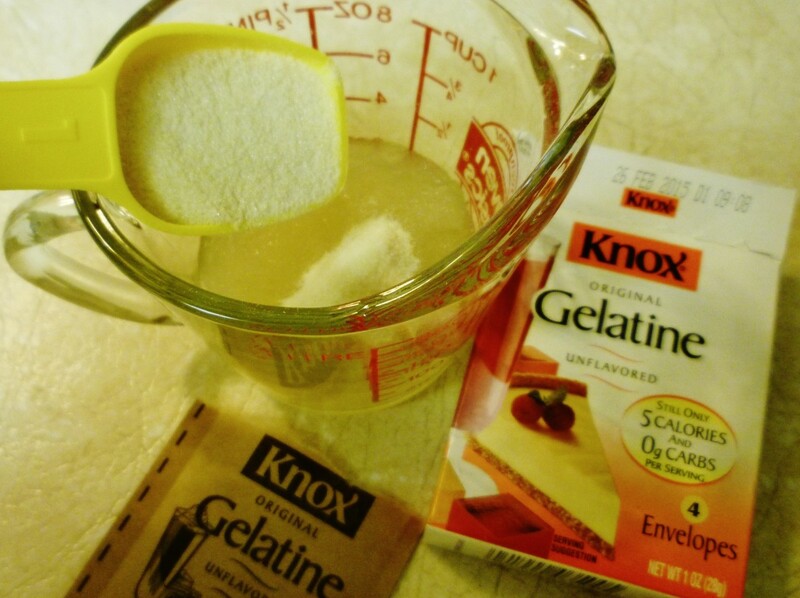 But I mess confess to a strange fear of using gelatin. Don't know why. Perhaps I will face my fears and try this one out! Thank you! I feel honored to have won one of the weekly prizes out of so many good entries. Enjoy this no bake refrigerator cheese torte with your daughter. Appreciate your comment. Oh, I just love this old fashioned dessert! I think some of the old recipes are the best. I can't wait to try this one with my daughter! And congrats on the weekly win! Thanks Mary. I feel honored to have been chosen as one of the daily winners by the judges in the cooking contest. Perhaps they liked it because it was such an old recipe brought to life again. Appreciate your comment. Just wanted to come back and add my congrats on your winning recipe. I had read it earlier and I thought it was a winner then. It is true that so many good recipes have popped up because of this HP contest. Trying them all would take some time! Thanks for the congrats on this refrigerator cheese torte recipe, your comment, votes and the share. Appreciate it! Congrats for your win! I love HubPages! I don´t have to buy cook books again. I´ll definitely try this Cheese Torte. Thanks for sharing Peggy. Voted up and awesome! Thanks for the congratulations on this hub winning one of the daily prizes in this current recipe contest. It was a welcomed surprise and honor, as there are so many good recipes being submitted by very talented writers. Nice to know that you liked the photos of this refrigerator cheese torte. Thanks for your comment. Quite often those old recipes like this one are the best. Enjoy this refrigerator cheese torte when you make it. I do have a facebook account but go weeks at a time...sometimes a month or more without looking at it. Also, I don't have that many "friends" because when people have wanted to "friend" me, if I did not know who they were, I always declined. I don't play those games, send smiles or other things that many people do. Someone suggested setting up another account and friending everyone. Is that what you have done? I have just been leary about letting too many people know personal information...but with another account...almost like a business account...that could be done. Your prayer request group idea sounds like a good one. Obviously you must allow many people to join. Let me know how you handle your FB account if different from the way I do it. Thanks! And thanks for your comment and invitation. Congrats on a well deserved win,Peggy! My mouth is watering just eyeing the torte in the pics. 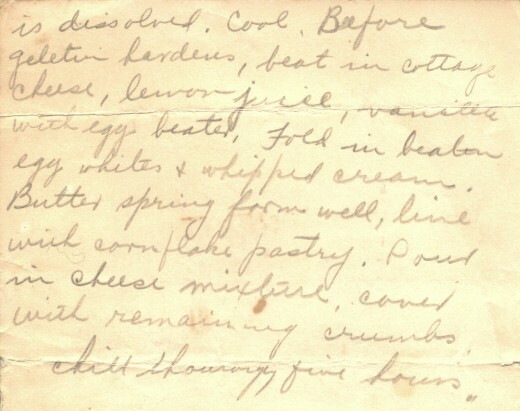 Wonderful to see a handwritten recipe and thanks for sharing this handed down recipe. Peggy.. I am going to try this.. it looks wonderful.. I find these recipes from our family members that's been around for years and years are the best.. I love your pictures.. of your family members and your stories about them.. are you on Facebook? I am Deborah Brooks Langford.. I have started a prayer request page.. I would love for you to join.. if you want to.. Thanks for the congrats and thanks for taking the time to read about this old time family recipe. Appreciate your comment. Congrats on your win, Peggy W!! Thanks ktrapp. It is fun venturing back in memories and tasting some of these old time recipes that came from my family. Appreciate your comment and the congrats on the weekly win in this current recipe contest. I know two things for sure - (1) I should not be perusing this recipe before dinner, and (2) Your grandmother must have been a fabulous baker. I always enjoy seeing her handwritten recipes, as well as the family photos and stories that go along with them. Another terrific looking recipe! I'm so glad this hub was one of the weekly contest winners as it is very deserving of the recognition. Thank you so much for the congratulations on a winning entry in this monthly contest. My long gone relatives would probably also be amazed and happy. Really appreciate your 5 star rating and your votes. Thank you so much for the congrats on winning for this old fashioned recipe that I found from looking through my mother's saved files from our relatives. Still have more to sift through and possibly do some sample cooking and baking. This is a thrill to know that others are interested in these old recipes.